چیره, سمیرا, علی زاده, رستم, مرادی, لیدا. (1396). اثر سه هفته تمرین رکاب زدن با و بدون انسداد عروق بر غلظت پلاسمایی آیریزین و PGC-1α مردان سالم. 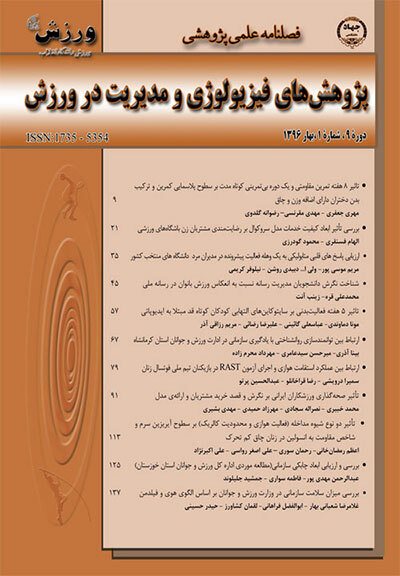 پژوهش های فیزیولوژی و مدیریت در ورزش, 9(4), 95-105. سمیرا چیره; رستم علی زاده; لیدا مرادی. "اثر سه هفته تمرین رکاب زدن با و بدون انسداد عروق بر غلظت پلاسمایی آیریزین و PGC-1α مردان سالم". پژوهش های فیزیولوژی و مدیریت در ورزش, 9, 4, 1396, 95-105. چیره, سمیرا, علی زاده, رستم, مرادی, لیدا. (1396). 'اثر سه هفته تمرین رکاب زدن با و بدون انسداد عروق بر غلظت پلاسمایی آیریزین و PGC-1α مردان سالم', پژوهش های فیزیولوژی و مدیریت در ورزش, 9(4), pp. 95-105. چیره, سمیرا, علی زاده, رستم, مرادی, لیدا. اثر سه هفته تمرین رکاب زدن با و بدون انسداد عروق بر غلظت پلاسمایی آیریزین و PGC-1α مردان سالم. پژوهش های فیزیولوژی و مدیریت در ورزش, 1396; 9(4): 95-105. 1کارشناس ارشد فیزیولوژی ورزشی، دانشگاه آزاد اسلامی واحد تهران شمال، تهران، ایران. 3استادیار گروه علوم ورزشی، واحد تهران شمال، دانشگاه آزاد اسلامی، تهران، ایران. هدف این تحقیق، بررسی تعیین اثر سه هفته تمرین رکاب زدن با و بدون انسداد عروق بر غلظت پلاسمایی آیریزین و PGC-1α مردان سالم بود. 24 نفر از دانشجویان تربیت­بدنی دانشگاه خوارزمی به‌صورت داوطلبانه در این پژوهش شرکت کردند و به سه گروه (8 نفری) رکاب زدن همراه با انسداد عروق پا، رکاب زدن بدون انسداد و کنترل تقسیم شدند. برنامۀ تمرین شامل 3 وهلۀ سه‌دقیقه‌ای رکاب زدن با شدت 50 درصد حداکثر وات (Wmax) با 30 ثانیه استراحت بین هر وهله، به مدت 3 هفته و هر هفته 3 جلسه تمرین بود. داده­ها با استفاده از آزمون تی همبسته و آنالیز واریانس یکطرفه در سطح 05/0P≤ تجزیه‌وتحلیل شدند. نتایج نشان داد بین مقادیر آیریزین پیش‌آزمون و پس‌آزمون سازگاری گروه انسداد (001/0=P) و بدون انسداد (011/0=P) تفاوت معنا­داری وجود دارد، اما بین مقادیر آیریزین پیش‌آزمون و پس‌آزمون سازگاری گروه کنترل تفاوت معناداری مشاهده نشد (05/>P). همچنین، بین مقادیر PGC-1α پیش‌آزمون و پس‌آزمون سازگاری گروه انسداد (001/0=P) و بدون انسداد (04/0=P) تفاوت معناداری وجود داشت (05/0>P)، اما بین پیش‌آزمون و پس‌آزمون مقادیر PGC-1α سازگاری گروه کنترل تفاوت معناداری وجود نداشت (05/> P). با توجه به یافته­های تحقیق حاضر به­نظر می­رسد هر دو نوع تمرین آثار سودمندی بر عوامل درگیر در متابولیسم انرژی در افراد فعال دارند و بین اثر دو نوع تمرین تفاوتی وجود ندارد. 1MS c, Department of Sports Science, North Tehran branch, Islamic azad university, Tehran, Iran. 2department of Sports Science, School of Literature and Humanities, Ilam University, Ilam, Iran. Abe T, Fujita S, Nakajima T, Sakamaki M, Ozaki H, Ogasawara R, et al. (2010). Effects of Low-Intensity Cycle Training with Restricted Leg Blood Flow on Thigh Muscle Volume and VO2MAX in Young Men. J Sports Sci Med. 9(3): 452–458. Baar K, Wende AR, Jones TE, Marison M, Nolte LA, Chen M, et al. (2002). Adaptations of skeletal muscle to exercise: rapid increase in the transcriptional coactivator PGC-1. FASEB J. 16(14):1879-86. Boström P, Wu J, Jedrychowski MP, Korde A, Ye L, Lo JC, et al. (2012). A PGC1-[agr]-dependent myokine that drives brown-fat-like development of white fat and thermogenesis. Nature. 481(7382):463-8. Boström PA, Fernández-Real JM. (2014). Metabolism: Irisin, the metabolic syndrome and follistatin in humans. Nat Rev Endocrinol. 10(1):11-2. Boudina S, Graham TE. (2014). Mitochondrial function/dysfunction in white adipose tissue. Exp Physiol. 99(9):1168-78. Burgomaster KA, Howarth KR, Phillips SM, Rakobowchuk M, Macdonald MJ, McGee SL, et al. (2008). Similar metabolic adaptations during exercise after low volume sprint interval and traditional endurance training in humans. J Physiol. 586(1):151-60. Daskalopoulou SS, Cooke AB, Gomez YH, Mutter AF, Filippaios A, Mesfum ET, et al. (2014). Plasma irisin levels progressively increase in response to increasing exercise workloads in young, healthy, active subjects. Eur J End ocrinol 171: 343-52. Godin G, Desharnais R, Valois P, Lepage L, Jobin J, Bradet R. (1994). Differences in perceived barriers to exercise between high and low intenders: observations among different populations. American Journal of Health Promotion. 8(4):279-385. Handschin C, Spiegelman BM. (2008). The role of exercise and PGC1α in inflammation and chronic disease. Nature. 454(7203):463-9. Haywood, Kathleen M. Translation: Namazizade, M and Aslankhani, MA. Growth and motor development in a lifetime, in 2008, the publisher. Horiuchi M, Okita K. (2012). Blood flow restricted exercise and vascular function. International journal of vascular medicine. 1-17. Huh JY, Mougios V, Kabasakalis A, Fatouros I, Siopi A, Douroudos II, et al. (2014). Exercise-induced irisin secretion is independent of age or fitness level and increased irisin may directly modulate muscle metabolism through AMPK activation. The Journal of Clinical Endocrinology & Metabolism. 99(11): 2154-61. Huh JY, Panagiotou G, Mougios V, Brinkoetter M, Vamvini MT, Schneider BE, et al. (2012). FNDC5 and irisin in humans: I. Predictors of circulating concentrations in serum and plasma and II. mRNA expression and circulating concentrations in response to weight loss and exercise. Metabolism. 61(12):1725-38. Khalafi M, Shabkhiz F, Alamdari KA, Bakhtiyari A. (2016). Irisin Response to Two Types of Exercise Training in Type 2 Diabetic Male Rats. Arak Medical University Journal (AMUJ). 19(111): 37-45. Kraemer RR, Goldfarb AH, Reeves GV, Meachum WA, Castracane VD. (2016). Effects of partial vascular occlusion on irisin responses to loaded muscle contractions. Appl Physiol Nutr Metab. 41(3):332-4. Kusminski CM, Scherer PE. (2012). Mitochondrial dysfunction in white adipose tissue. Trends Endocrinol Metab. 23(9):435-43. Laursen PB. (2010). Training for intense exercise performance: high-intensity or high-volume training? Scand J Med Sci Sports. 20 Suppl 2:1-10. Leslie E, Owen N, Salmon J, Bauman A, Sallis JF, Lo SK. (1999). Insufficiently active Australian college students: perceived personal, social, and environmental influences. Prev Med. 28(1):20-7. Loenneke JP, Wilson GJ, Wilson JM. (2010). Mechanistic approach to blood flow occlusion. Int J Sports Med. 31(1):1-4. Moienneia N, Attarzadeh Hosseini SR. (2016). Acute and chronic responses of metabolic myokine to different intensities of exercise in sedentary young women. Obesity Medicine. 1:15-20. Norheim F, Langleite TM, Hjorth M, Holen T, Kielland A, Stadheim HK, et al. (2014). The effects of acute and chronic exercise on PGC‐1α, irisin and browning of subcutaneous adipose tissue in humans. FEBS Journal. 281(3):739-49. Pekkala S, Wiklund PK, Hulmi JJ, Ahtiainen JP, Horttanainen M, Pöllänen E, et al. (2013). Are skeletal muscle FNDC5 gene expression and irisin release regulated by exercise and related to health? The Journal of physiology. J Physiol. 591(21):5393-400. Rajni DM, Surajeet KP. (2013). Irisin, a Novel Myokine Responsible for Exercise Induced Browning of White Adipose Tissue. Indian J Clin Biochem. 28(1): 102–103. Roca-Rivada A, Castelao C, Senin LL, Landrove MO, Baltar J, Belén Crujeiras A, et al. (2013). FNDC5/irisin is not only a myokine but also an adipokine. PLoS One. 8(4):e60563. Sanchis-Gomar F, Lippi G, Mayero S, Perez-Quilis C, García-Giménez JL. (2012). Irisin: A new potential hormonal target for the treatment of obesity and type 2 diabetes. J Diabetes. 4(3):196. Schuster DP. (2009). Changes in physiology with increasing fat mass. In Seminars in Pediatric Surgery. Semin Pediatr Surg. 18(3):126-35. Timmons JA, Baar K, Davidsen PK, Atherton PJ. (2012). Is irisin a human exercise gene? Nature. 488(7413): 9-10. Tsuchiya Y, Ando D, Goto K, Kiuchi M, Yamakita M, Koyama K. (2014). High-Intensity Exercise Causes Greater Iris in Response Compared with Low-Intensity Exercise under Similar Energy Consumption. Tohoku J Exp Med 233: 135-40. Wenz T, Rossi SG, Rotundo RL, Spiegelman BM, Moraes CT. (2009). Increased muscle PGC-1α expression protects from sarcopenia and metabolic disease during aging. Proc Natl Acad Sci U S A. 106(48):20405-10. Xu X, Ying Z, Cai M, Xu Z, Li Y, Jiang SY, et al. (2011). Exercise ameliorates high-fat diet-induced metabolic and vascular dysfunction, and increases adipocyte progenitor cell population in brown adipose tissue. Am J Physiol Regul Integr Comp Physiol. 300(5): 1115-25.